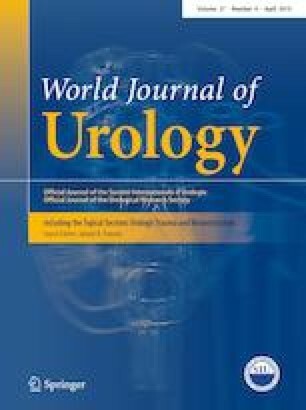 To evaluate the impact of previous urethroplasty on complication rates and postoperative continence after primary artificial urinary sphincter (AUS) implantation in male patients with severe stress urinary incontinence. A prospective evaluation of patients undergoing primary AUS implantation was conducted. Patients with previous radiotherapy, AUS implantation or urethral stent placement were excluded. Main endpoints were postoperative continence and complication rates including necessity of AUS explantation. Kaplan–Meier analysis evaluated explantation-free survival. Logistic regression analyses were performed to identify potential predictors for AUS explantation. 105 patients were included with a mean follow-up of 76.6 months (SD 15.9). 30 of these patients had a history of urethroplasty. Postoperatively, 96.2% of all patients were objectively continent (≤ 1 pad/day). No differences in postoperative continence and early complication rates were observed. Concerning long-term complications, infection, mechanical implant failure, and tissue atrophy were also comparable. Overall sphincter erosion rate was 12.3%, but significantly higher in urethroplasty patients (23.3% vs. 8.0%, p = 0.038) and sphincter explantation rate was threefold higher (p = 0.016) in the urethroplasty group. Furthermore, explantation-free survival was reduced compared to the non-urethroplasty group (p = 0.044). On logistic regression analysis, the previous urethroplasty was the only significant predictor for AUS explantation (p = 0.016). AUS implantation in patients with former urethroplasty can provide satisfying results. Compared to patients without the previous urethroplasty, the higher risk of cuff erosion and AUS explantation has to be addressed during preoperative consultation. Patients with the previous urethroplasty with grafting, long strictures and previous visual internal urethrotomy might be at highest risk. KS: project development, data collection, and analysis, manuscript writing. RO: manuscript editing. BK: data collection. MO: data collection. MS: data collection. MB: manuscript editing. RM: manuscript editing. BR: project development, data analysis, and manuscript writing. The study has been performed in accordance with the ethical standards of the institutional and/or national research committee and with the 1964 Helsinki declaration and its later amendments or comparable ethical standards.